FAQs » Frequently Asked Questions (English) » How can I report on all donors who gave more than a certain amount within some year? How can I report on all donors who gave more than a certain amount within some year? How do I create an installation CD to share with others? How can I resolve the error, "Error Loading Plug-In Manager"? How can I develop a plugin in C# that adds a new accounting system to the list of "Integrated General Ledgers"? Can I manually control Contact IDs? How can I get past an error when I try to install DonorWise? How do I get past, "[Microsoft][ODBC SQL Server Driver][DBNETLIB]SQL Server does not exist or access denied., [Microsoft][ODBC SQL Server Driver][DBNETLIB]ConnectionOpen (Connect())"? How do I get past, "Invalid combination of GL Account and RC"? How do I get past, "*SQL Server*Login failed for user '*'"? How do I get past, "You must supply a value for Designation ID"? How do I get past, "You must supply a value for GL Account"? How do I get past, "You must supply a value for Donor ID"? How do I get past, "You must supply a value for RC"? How do I install DonorWise to get started? How do I install DonorWise on Windows 8 or 10? 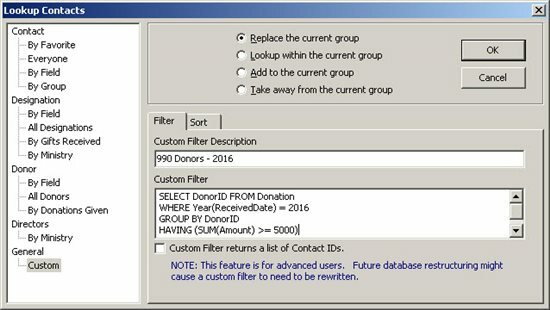 How can I run a SQL command against my DonorWise database? When my fiscal year starts in January, why is DonorWise posting into the next year with Dyanmics SL (Solomon)? How can I produce an annual report or year end summary receipt for my donors? What are the SMTP settings for Gmail? How can I outsource printing and mailing Year End Statements? Click "OK" to see the list of donors. You can change the dates highlighted as needed.